I am not a chef. To me, a chef is someone that has lead a kitchen through thick and thin, has great imagination, cooking skills, sense of taste and aesthetic. I just enjoy eating and playing with food. My first serious catering job was for my dear friends Nora and Matthew’s wedding. Their dessert caterer fell through and Kate, a mutual friend, asked if I could help. I came with an idea but I needed someone with more experience on these matters. Enter my dear friend Clayton, aka Picosa, the Tango to my Cash and very talented and experienced chef. When I felt lost or overwhelmed, she helped me pushing through. At the end, we provided beautiful heart-shaped gluten-free churros served with dipping dulce de leche with sel gris, Mexican wedding cookies, strawberries and a Mexican chocolate fountain to dip all these in. I’m very fortunate to have people like Nora, Matthew, Kate, and Clayton in my life. Thankfully, I had someone with the same can-do attitude, supporting and helping my needs before I got to San Jose. Enter Diane Osborne. She was one of the persons participating on the planning event email chain, my main handler in San Jose and was the no-nonsense person that I needed. The first time we spoke over the phone was electric. She clearly had experience catering and even more so, the local contacts to make the reception happen smoothly. She spoke to me in English with sprinkles of Spanish here and there. It helped me feel more confident and reassured. I can’t be thankful enough for her kind badassness. We set up a plan. I would order some items online through Safeway to be delivered to her home the weekend before the event. This would include pork for the carnitas, mushrooms, onions, garlic, and the rest of the ingredients for the salsas. She also advised me about places to get the corn masa for the gorditas. A few calls later, I had zeroed in to a local Mexican market to get what I needed. Things were moving along. “Adios, guapo!” she said, after the end of my conversation. I blushed a little bit. 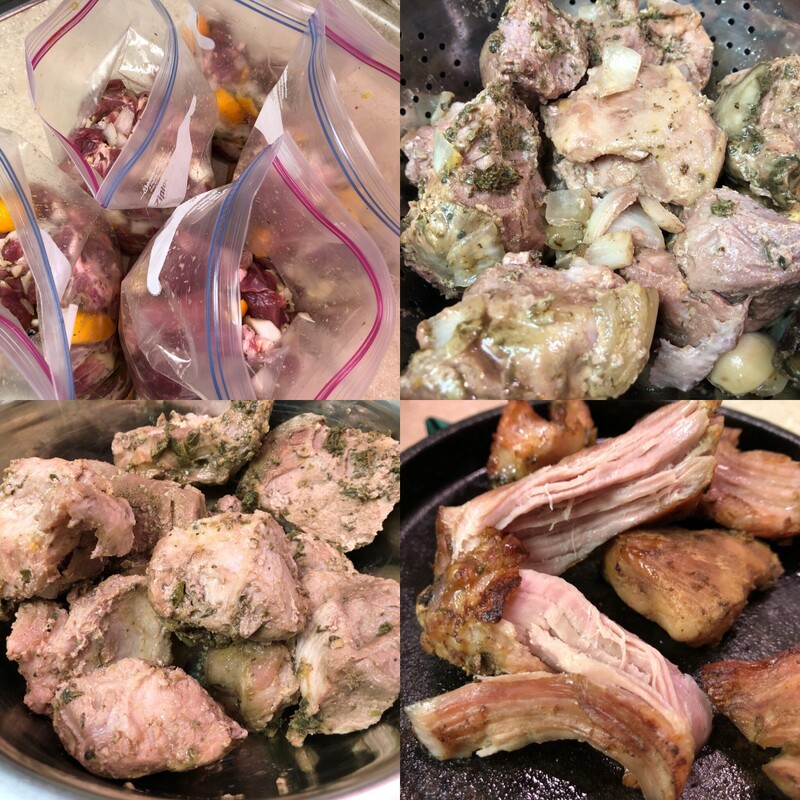 On the home front, I started adapting my Abuela Elena’s carnitas recipe to cook it using sous vide. The traditional way to make carnitas is over a HUGE copper pot of with lard. When the meat is ready, you add milk and orange juice. If you are worried about a grease fire and 1st degree burns, let me share I had the same fears. However, the first time I tried this method, the hot lard produced the most anticlimactic results when adding the other liquids. I remember thinking “Is that it? !” My face was intact, so that is always good. Previous experiments with adding milk to the sous vide method provided sour results, literally. The milk curdled, adding an unpalatable aftertaste to the carnitas. I opted for experimenting with a couple of options. Using my Excalibur, I dehydrated whole milk and heavy cream, hoping to get the flavors I wanted. I also used commercial powdered milk to see if that was viable solution. Don’t cha wish your carnitas were hot like these? In the end, the dehydrated heavy cream provided the flavor and crust I was looking for my carnitas. The mushrooms were a bit easier. Technically, I would be poaching the mushrooms in olive oil, accompanied by onion, garlic, and herbs. The most important of the lot, epazote, would give the fungi the smokey flavor I grew up loving. 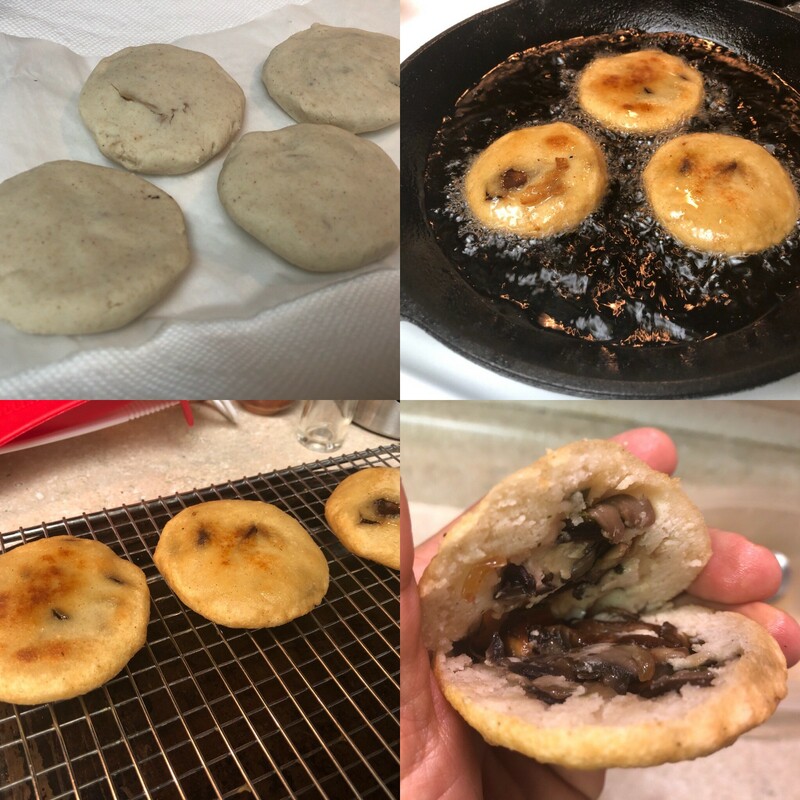 The gorditas were an easy process. Grab a ball of masa, then stuff it with whichever filling you choose. Traditionally, the masa has also a bit of fat, usually lard. My plan was using the leftover fat/oil from the sous vide on both processes to make the gordita even more flavorful. The flat masa disk is then fried to get a crispy yet chewy interior. The tests were successful and, more importantly, delicious. At this point, other parts of my trip were arranged: a decent fare from Austin to San Jose thanks to Southwest, a very affordable AirBnB with unknown/FB connections, now roommates Vania Soto and Rick Canfield, both Mexicanx recipients. The update that made me take a step back was looking at the guest list for the event. George R. R. Martin would be there. A bit of anxiety crept up saying “So, there’s the potential of food poisoning RR. I’m sure the internet will look kindly upon you.” I went for a brief walk to calm myself, accompanied by My Favorite Murder Podcast and a handful of almonds. Now, budgeting. According to friends in the hospitality industry, this is why so many restaurants fail. A dish can sound AMAZING but if the price isn’t appealing, no one will try it. My budgeting also needed to take into account time, both to prepare things and to cook everything. I had the time down for the ingredients I would sous vide but making everything and having it stay fresh might be trickier. I saw the possibility of storing the gorditas in the oven before the event could keep these crispy and tasty. It was worth a shot. I though I had everything under wraps and the plan would go without a hitch. However, I tend to think on worst case scenarios when cooking. “If this fails, which is your plan B?” I started thinking about options. I was assured by Diane that I would get help in the kitchen but even with an extra pair of hands, catering for over 100 person could be daunting. At this point, my good old friend math came to my rescue, beating some sense into me. Each gordita needed 50 grams of masa to be made. I had budgeted 4 gorditas per guest. I would make 350 carnitas gorditas and 150 vegan ones. 500 gorditas X 500 grams = 25 kilos of masa = 55 pounds of masa. The idea of making 500 masa balls, shaping each into perfect disks, then frying these sunk in. BRIEF SPANISH LINGO CLASS: There’s an expression in Mexico that, if literally translated, doesn’t make sense. The meaning can go from “NOPE!” “I give up” or “I’m feeling lazy.” The expression’s origins is from the word “Huevón,” which is a way to describe a man with big testicles or, more often, someone who is lazy, due to his testicles being so large. The word is used by everyone, no matter the size of their testes or lack of these. This plan would need some adjustments but it could be worked out. Now, to wait until my flight on August 15th. I dreamt that night of waves and surfing on an unknown beach. I’ve never surfed. I did ok and had fun in my fantasy. It felt like a good omen.